When you’re thinking of ways to renovate and rejuvenate your home, you may not stop to consider the exterior. However, updating the outside of your house can help improve your curb appeal while reducing maintenance and energy use. Not to mention, having an improved exterior will immediately boost your homes visual appeal. 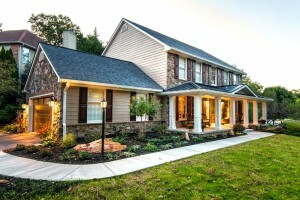 Are you looking for ways to add value to your Maryland home? Discover why a luxury exterior renovation is the perfect place to start. By renovating your exterior, you have the ability to customize your siding and trim materials; increasing the visual appeal of your entire home. Updating the exterior is particularly useful in regards to older, outdated homes. Replacing worn windows and doors can improve the aesthetic of your home, and decrease the amount of energy you use each month. Establishing an energy efficient home is now more important than ever. Simply upgrade to energy efficient windows, doors, and siding to keep air conditioning and heat indoors. Not to mention, if you replace your siding, additional insulation can be added during the transition period to increase your home’s energy efficiency further. If you live in an older home, you know just how much maintenance can be required. Old gutters can sag, siding can loosen, and roofing sections may need repairs. Today’s materials for exteriors are far more durable and require less maintenance than ever before. By upgrading now, your home will require less maintenance in the years to come. If you choose to complete a luxury exterior renovation on your Maryland home, you may see up to 77% in return profits if you decide to sell your home. Prospective homeowners will pay more for a home with a durable, beautiful, energy efficient exterior. The visual upgrade will attract so many homebuyers, your home will sell in no time. To learn more about how an exterior renovation can bring value and benefits to your Maryland home, call the experts today! Find a contractor that specializes in additions and major renovations, such as Cossentino & Sons. A licensed, experienced remodeling team isn’t a luxury; it’s a necessity. At Cossentino and Sons Remodeling & Design, Inc. we are passionate about giving you home improvements that benefit your home and your home’s value. We are a family owned business with an expert and experienced eye for details. We serve the Howard, Montgomery, Baltimore, and Carroll County, Maryland areas. To learn more about how we can help you get your remodel started, visit us online or call (410) 442-0000. To see examples of our work and learn more about how to help your home, follow us on Facebook, Twitter, Google+, and Pinterest. This entry was posted on Friday, May 11th, 2018	at 7:16 pm	and is filed under Exterior Renovations	. You can follow any responses to this entry through the RSS 2.0	feed. Both comments and pings are currently closed.